FILE - Security forces inspect the site of a suicide bomb attack in Kabul, Afghanistan, Nov. 29, 2018. Pakistan's military says it is taking "every step" required to help the United States successfully achieve a political reconciliation in Afghanistan and exit the war-shattered country "as friend of the region, not as a failure." "This political reconciliation must succeed. ... We wish that the U.S. leaves Afghanistan as friend of the region, not as a failure," Ghafoor said, without elaborating further. Ghafoor reiterated Pakistan's influence with the insurgent group has diminished over the years, but said Pakistan will use "whatever contacts we have" to facilitate the Afghan peace effort. "You are aware that Afghan refugees have been living here [in Pakistan] for 40 years. So, they [the Taliban] have families and links here. That is how as much as we can we will facilitate," the spokesman explained when asked what Pakistan could do to nudge the insurgents to engage in peace negotiations. "We have already fenced more than 600-kilometer proton of the border.The construction of forts and new posts has also been completed by 60 percent.God willing when the entire fence would be in place by the end of next year, we assume the cross-border threat facing us will reduce to a large extent." 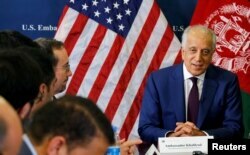 "Ambassador Khalilzad stressed the United States' commitment to facilitating a political settlement between the Afghan government and the Taliban that ensures Afghanistan never again serves as a platform for international terrorism and ends the 40-years-long war in the country," noted the embassy statement.